It's not often that you'll find one model of SUV that covers a price range from $26,980 to $47,480. Most manufacturers like to keep model range price variance a lot closer than that. 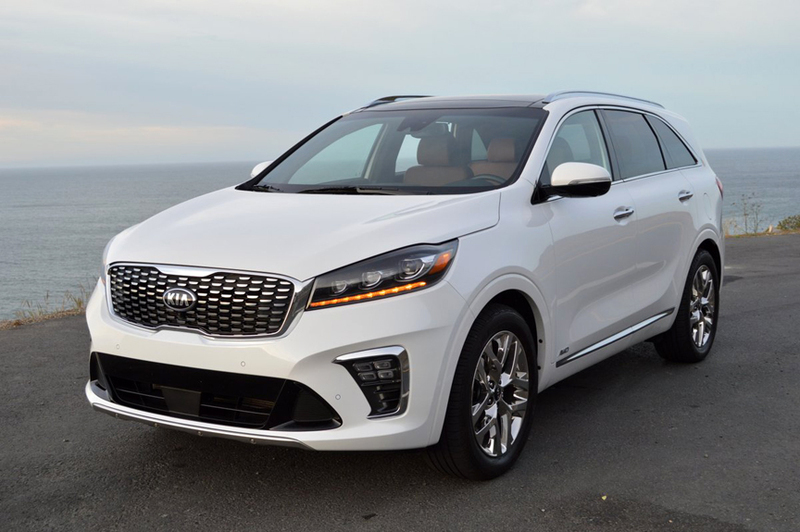 But if you buy a Sorento from Kia, you can buy the base model FWD, 185hp inline 4 for almost $20,000 less than the AWD, 290hp V6 SXL. At a base price of $46,490, our test Sorento SXL topped the range, with its 3.3 liter V6, standard all-wheel-drive, 19 inch chrome alloy wheels, dual zone climate control, Harman Kardon Premium Audio, and Nappa Leather seats. The only options boosting the sticker price were "Snow White Pearl Effect" paint ($395), Cargo Net ($50), Cargo Cover ($150), Interior Lighting ($450), and Puddle Lights($240), for a grand total of $47,775. With delivery fee of $990, purchase of the SXL required an outlay of $48,765, making it one of the most expensive Kia products we have driven. Is it worth the money? The answer is an unqualified yes. 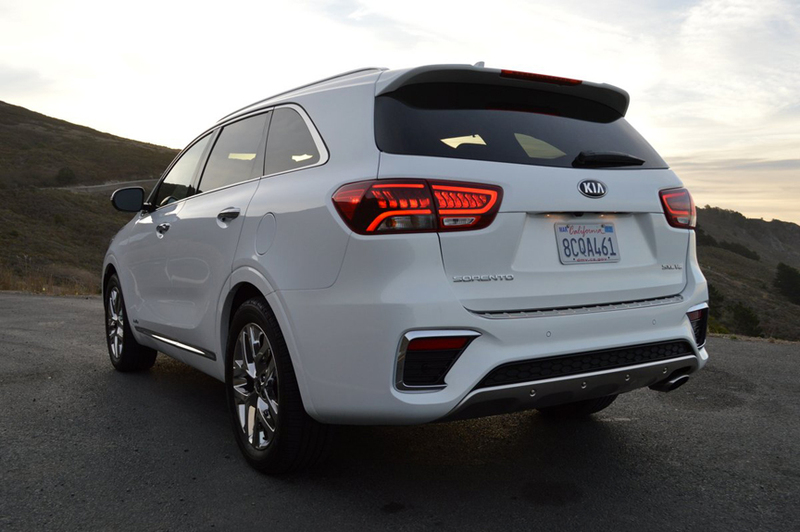 Of the many mid-size SUVs we've driven, this Kia had the widest sweet spot in terms of practicality, performance and overall livability. Let's start out with that most minor of options, the $50 Cargo Net. Once we affixed its somewhat testy retainer clips in place to string it across the rear cargo area, that net spent an entire week in full employment. Everything from a trio of grocery bags to a slew of Xmas presents found a happy home suspended in that hammock. Its unexpected usefulness was just a microcosm of the beneficial way the Sorento ingratiates itself into your daily life. The 3.3 liter direct gas injection V6 offers more than enough punch to insure safe passing on back roads or lane change maneuvers on the freeway. It's coupled to an 8-speed automatic gearbox which does a great job of multiplying the engine's 252lb.-ft. of torque for instant response at the throttle pedal. You can further sharpen throttle modulation by opting for the Sport setting via the console mounted driving mode button. As with most of the controls in the Sorento, you never have to take your eyes off the road to actuate your command. Same goes for the Harman Kardon entertainment system which is refreshingly easy to program initially and operate subsequently. Another plus is the location and operation of the transmission shift lever. As more and more manufacturers abandon the benchmark location and operation of the PRNDL shift system, Kia steadfastly maintains the status quo in this area of design. Since there was never anything wrong with PRNDL anyway, it's inexplicable why so many car makers have abandoned its use. At any rate, the Kia's apparatus works wonderfully well. Although no steering wheel paddles are provided for manual override, you can simply slot the console stick into its manual gate and bump shift the transmission lever forward and rearward for manual shifts up or down. 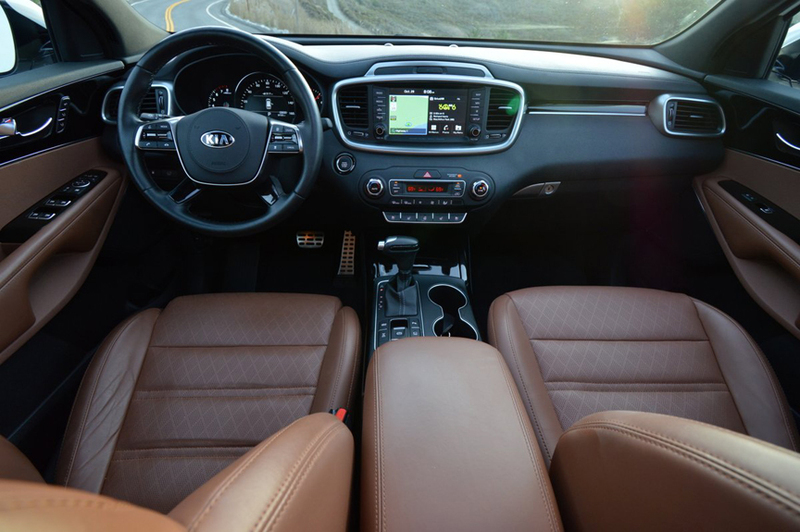 The Sorento's interior is roomy and spacious, with three seating rows for 7 occupants, and 37.5 cubic feet of storage space available when the second and third row seatbacks are leveled. 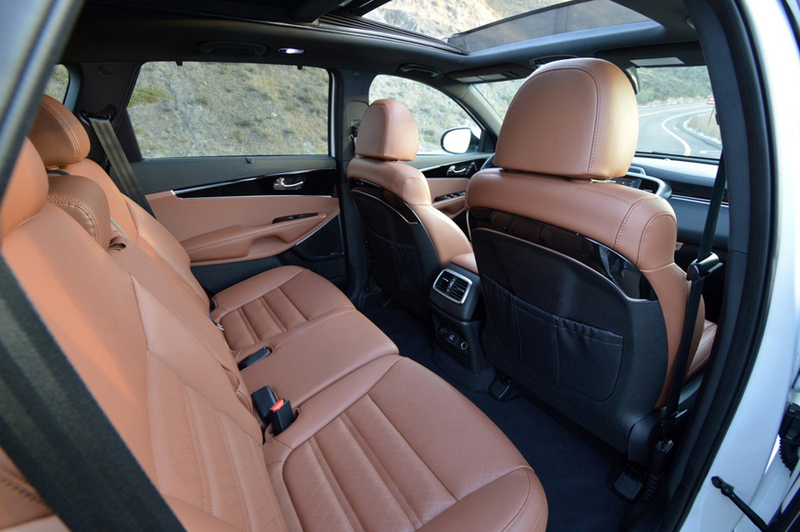 The Nappa leather seats look and feel inviting, with contrast colored stitching lending a refined touch to cabin decoration. Kia includes a standard array of driving safety assists, including Lane Keeping Assist, Smart Cruise Control with Stop and Go, Blind Spot Collision Warning, and Rear Cross Traffic Collision Warning. These aids are never intrusive, and unlike so many annoying assistance packages in other vehicles, the Kia devices were designed to help, rather than hinder the driving experience. A major component of that positive driving experience is attributable to the Sorento's keen handling. At all four corners, Michelin light truck rated Premier LTX tires (235/55R19) promise long tread life (TW 620) but respond with surprising finesse when put to the test on curvy roads. Augmenting the Sorento's strengths in packaging and straight line performance, the suspension tune achieves a happy median between comfort and precision. The median can be jiggled in favor of handling by selecting the Sport setting from the drive mode system. Spending $50,000 for a Sorento when you can buy an entry level example of the same nameplate for $26,000 may seem like a fool's errand. But making a decision on that basis alone would be fooling only yourself. Because, even at close to fifty grand, the Sorento SXL AWD is one of the best current SUV buys available today. HYPES: JD Power "Highest Ranked Vehicle Appeal Among Mid-Size SUVs"